Built by researchers in Germany, the latest generation of "Care-O-bot" is both cheaper and more versatile than its predecessors, offering a wide range of applications. In recent years, there has been significant progress in robotics – both in terms of technological development, and the number of these machines appearing in homes and workplaces. Just some examples include OSHbot (an automated retail assistant), RP-VITA (a telemedicine robot for hospitals), A.L.O. 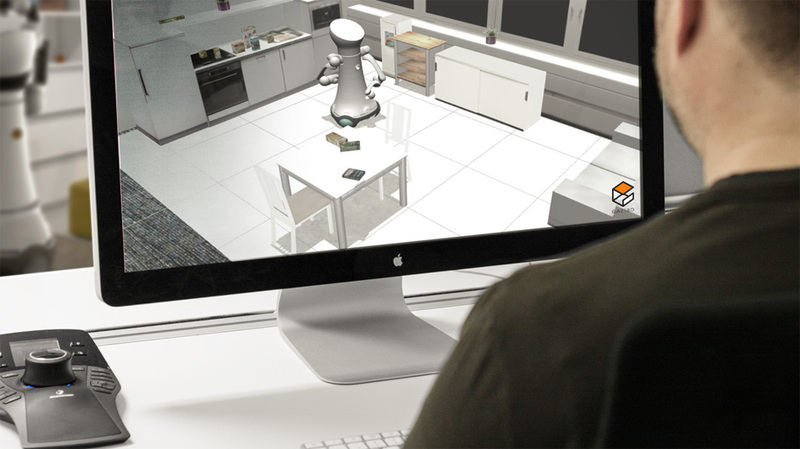 (a robotic butler, or "Botlr") and the latest model of ASIMO (arguably the most famous robot in the world). As they become cheaper, more versatile and ever more widespread, robots can fulfil an increasingly diverse range of activities. Within the next few decades, it is likely that they will become an everyday common sight in countries around the world. 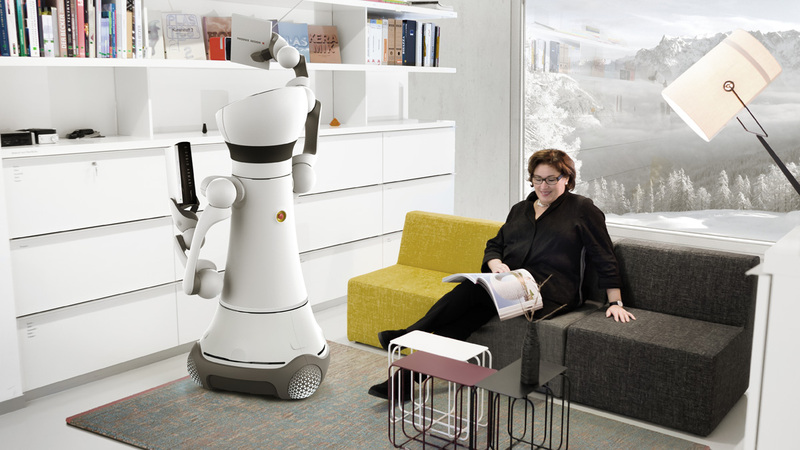 The Fraunhofer Institute in Germany has been developing service robots since the 1990s. One of their projects is the "Care-O-bot" – a two-armed, omnidirectional machine with autonomous navigation, object recognition and grasping abilities. It has gone through various design revisions since 1998 and the 4th generation has now been announced. Care-O-bot 4 is a major improvement on its predecessors. Described as "a universal helper for everyday scenarios", it is modular and can be adapted to a multitude of different scenarios at a cost that makes it commercially viable; from airports to apartments, care homes, DIY stores, hospitals, hotels, museums, restaurants, security applications and warehouses. 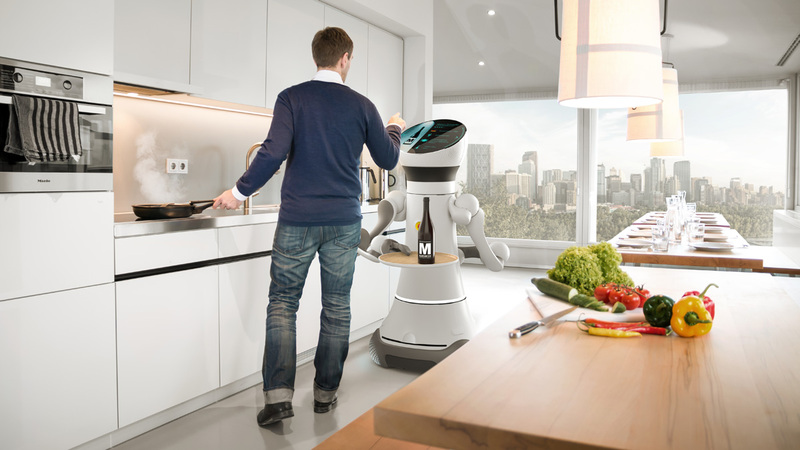 "The fourth generation of the Care-O-bot is not only more agile, modular and charming than its predecessors, but it also stands out through the use of cost-reducing construction principles," explains Dr Ulrich Reiser, Project and Group Leader at Fraunhofer IPA. 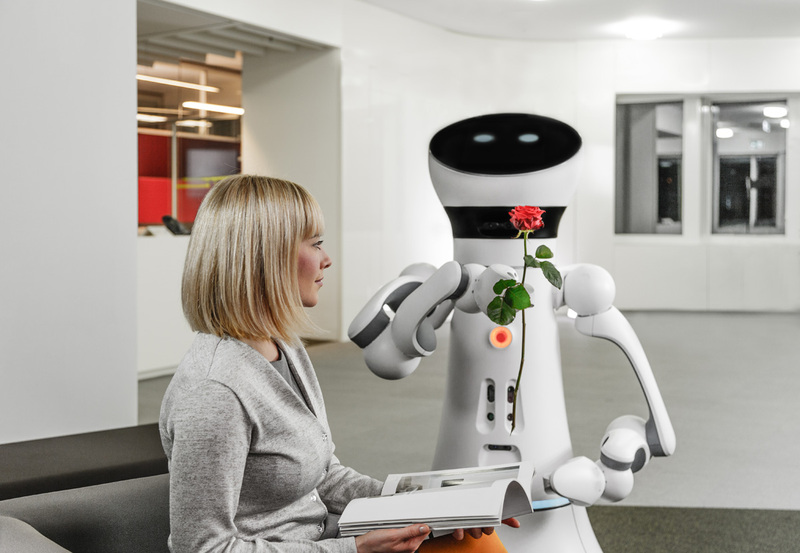 Andreas Haug, co-Founder and Managing Director of Phoenix Design, who partnered with Fraunhofer: "Care-O-bot 4 is a successful symbiosis of design and engineering, as well as functionality and emotion, which quickly encourages user interaction." Large parts of Care-O-bot 4's internal construction are made with folding sheet metal, which is economical to produce in small quantities. Its design is streamlined with a "head" section and two arms, meaning its form resembles a human being. However, the developers did not want its appearance to be over-human, as this would "encourage false expectations with regard to its capabilities", says Dr. Reiser. It is just the robot's "internal values" that are human: it always maintains a respectful distance, shows what it has understood and what it intends to do, while also being able to make simple gestures and reflect emotions. As with its previous versions, social role models were used as a guiding vision in developing the design and functionality. While the concept for the Care-O-bot 3 was a more reserved, cautious butler, its successor is more friendly and dynamic. Care-O-bot 4 also features a greater range of movements. Spherical joints around discreet pivot points on its neck and hips allow it to bend forward without losing its balance. Developers took inspiration from human anatomy, creating a moving part which shifts backwards when the robot bends over, ensuring balance is maintained when carrying a load in outstretched arms. It can make 360° rotations of its head and torso. An innovative one-finger hand with integrated sensors was developed in collaboration with manufacturing company Schunk. 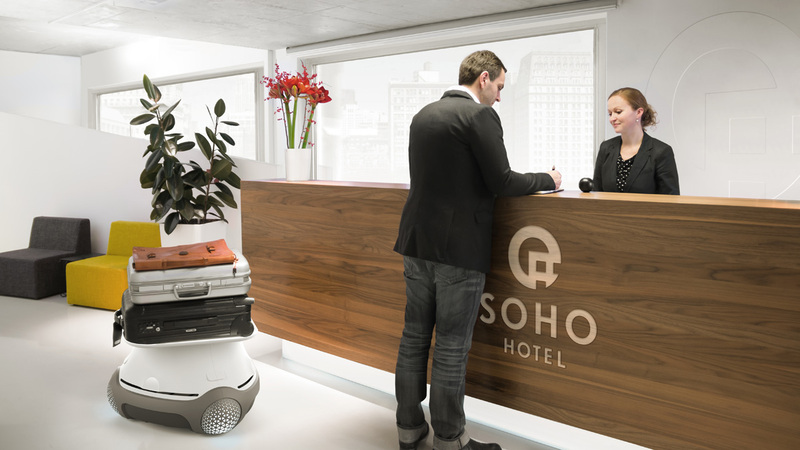 Managing partner Henrik Schunk comments: "The Care-O-bot 4 represents a significant milestone in the mobile service robot industry, on account of its high degree of standardisation." 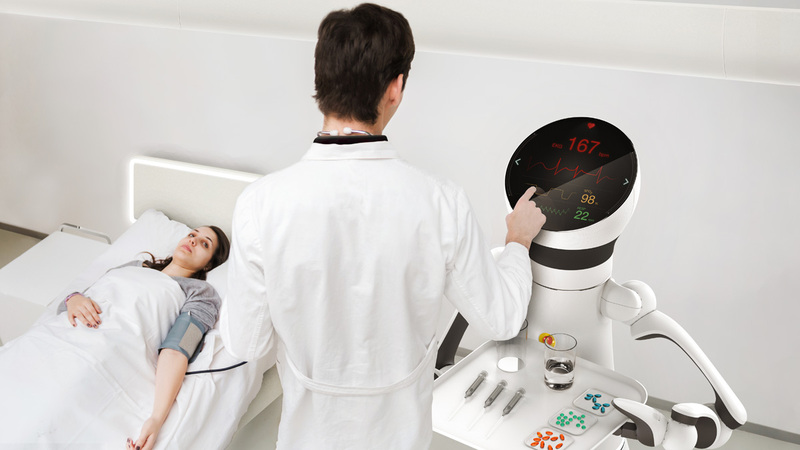 The Fraunhofer Institute was determined to ensure that Care-O-bot 4 is simple to use. The head is fitted with an easily accessible touchscreen and there is a microphone for speech recognition, along with cameras for personal and gesture recognition. 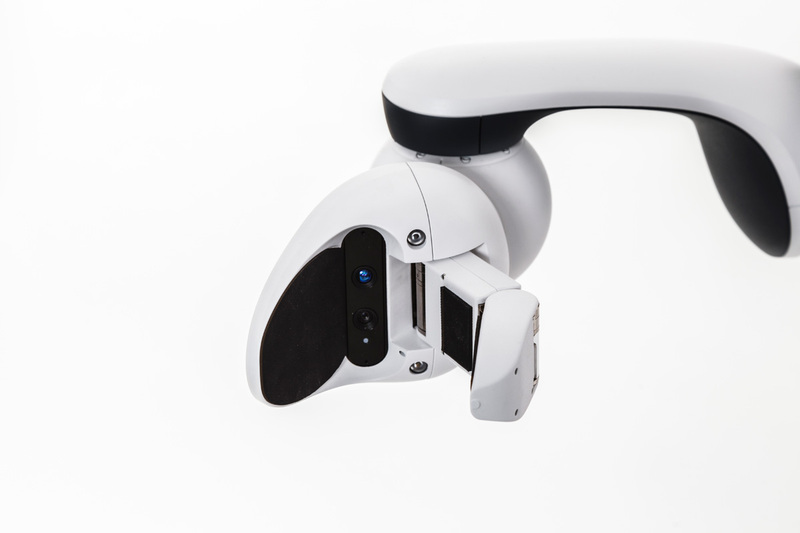 Care-O-bot 4's spherical joints allow it to intuitively inform users what it is planning to do and what it has understood, including gestures such as nodding and shaking the head. A circle of LEDs on its torso and a laser pointer in the hand serve as information exchange points. Care-O-bot 4 provides open software interfaces that make it easily expandable for developers. Ulrich Reiser is keen for as many scientists as possible to use the system developed in Stuttgart in order to steadily advance its possible areas of application: "The objective is to steadily grow the developer community that was established already around Care-O-bot 3," he explains. 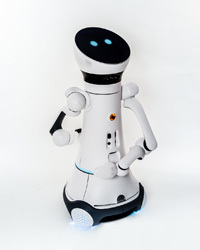 Numerous research institutions and universities around the world have already worked with Care-O-bot 3 and the new version 4 should follow suit.